Day of the Harvest is the annual celebration during autumn and a chance for all champions to show their might. Aside from other presents, the best fighter will be grated the most precious treasure of the Mage Council this year: Grace. Stories of Grace is still prevalent in Magerealm, with the power to break your enemy and purge all evil. Only the most tenacious and brave warrior can command its loyalty. Therefore, winning Grace is the ultimate testament to a champion’s strength. Grace is a small town situated in the South West corner of Magerealm. Legend has it that in the Holy Temple that worships Celeste is sealed the actual plumes of Celeste. After being banished by the Mage Council, the Demon race desired this land. Infusing the realm with their corruption, they tried to turn this beautiful planet into their own playground and prepared for invasion. Humans warriors and mages put up a courageous fight, but just when all seemed lost, the temple shattered. From within came Celeste, spreading her wings, she bathed the world with divine light. Celeste, who was created by the Titan, commands great power, her support changed the tide of the battle. After driving away the Demons and cleansing the land by expending all her power, she disappeared, leaving only a pair of immaculate wings behind. This pair of wings were named grace, and kept in the Holy Temple, waiting silently for the next champion. 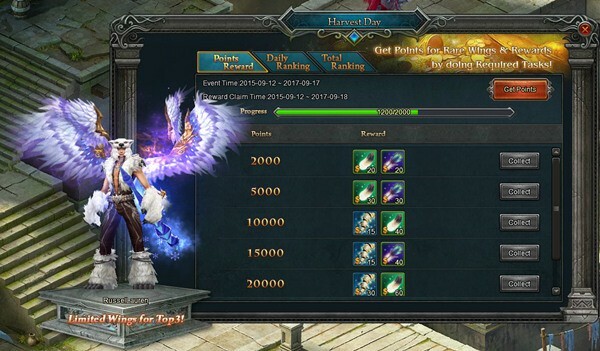 Player may get Harvest Point by doing required tasks during the event. Reach certain amount of points for the listed rewards. More points you get, the greater the rewards. Players who rank top20 will get extra rewards.